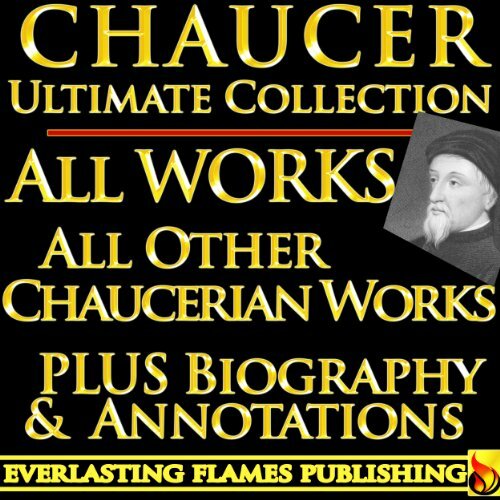 Are you a Chaucer fan or in need of a complete Chaucer collection? complete annotations and explannations for all of it? With a full length Biography? Then you want this all inclusive compilation from 'Everlasting Flames Publishing' - designed just for you. dominant literary languages in England were French and Latin. plus a comprehensive biography so you can experience the life of the man behind the words. Bonus material included in this collection. important to any study of or interest in Chaucer. CHAUCER AND HIS TIMES - A biography of Chaucer’s intriguing life, in historical context. and imagine the pleasure of discovering inspiration in Chaucer’s one of a kind creations. get. And available on the Kindle, this big collection is yours for next to nothing. So don't deny yourself! And don't accept other collections that are lacking. GET THIS COLLECTION RIGHT NOW - start enjoying Chaucer’s world like never before!